Downtown Phoenix has undergone a major revitalization in the 12+ years that I’ve been here. Starting in 2008 with the building of the Sheraton Phoenix Downtown, the first new hotel built in the area since 1976, it’s continued to expand every year with new restaurants, hotels, and chic living options. 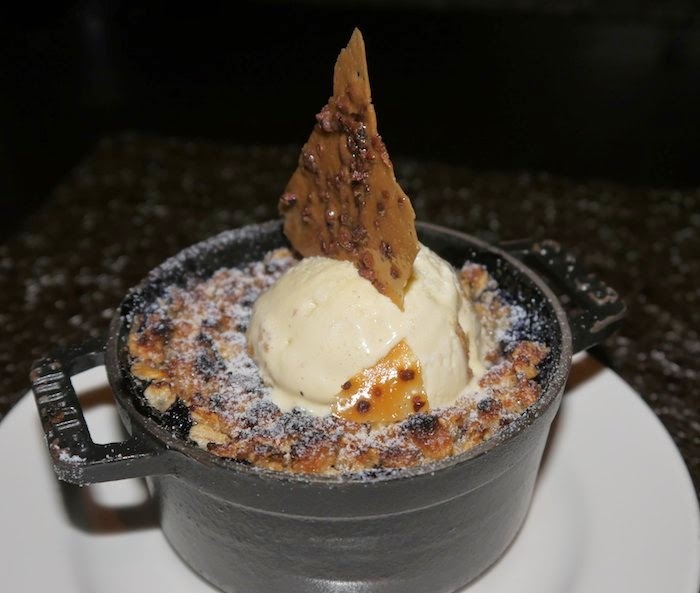 The Sheraton’s main restaurant, District American Kitchen and Wine Bar is one of many urban culinary destinations in the sprawling downtown Phoenix area. District specializes in American comfort food showcasing local products and herbs grown in their rooftop garden. Conveniently located in downtown and within walking distance of several art venues, District is a great place to enjoy a pre-event dinner. When it comes to group dining District has several options. 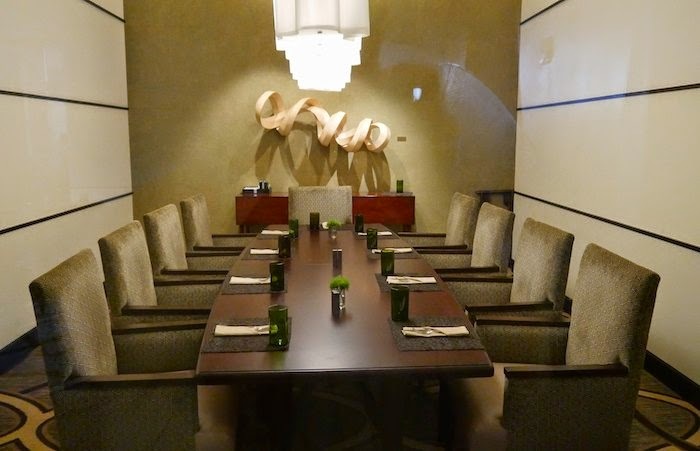 Besides two private dining rooms, there is also a communal table in the main dining area that seats 12 and an oval wine room for larger parties of 30-75. They offer open air patio seating for those mild Phoenix nights and live entertainment which plays in the evenings throughout the week in their bar. 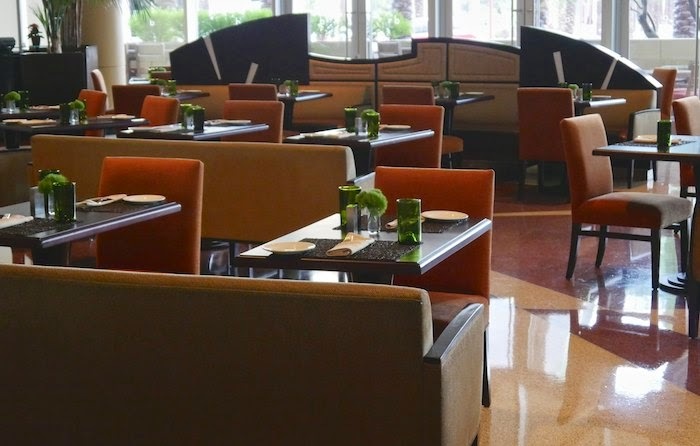 The menu is a nice mix of sophisticated yet accessible options that are reasonably priced and exceed the expectation of typical hotel food. 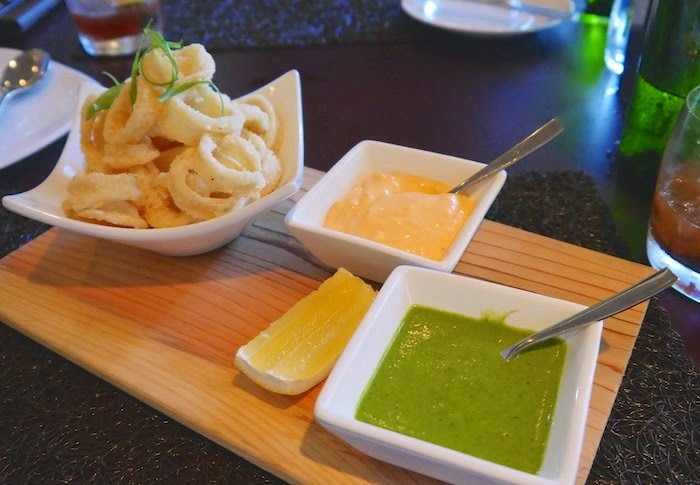 We started our dinner with the golden calamari, which is lightly coated in tapioca flour and served with a Siracha and citrus aioli and a refreshing house made chimichurri sauce. Both of which were equally delicious. We also sampled the sweet potato soup with roasted poblano crema. A relatively new item on the menu, the soup is reminiscent of the holidays with hints of cinnamon & nutmeg. Silky smooth and extremely rich, think comfort food at its finest. My husband chose the Nimbus Nut Brown Ale short Rib Stroganoff, another new menu item, as his entrée. 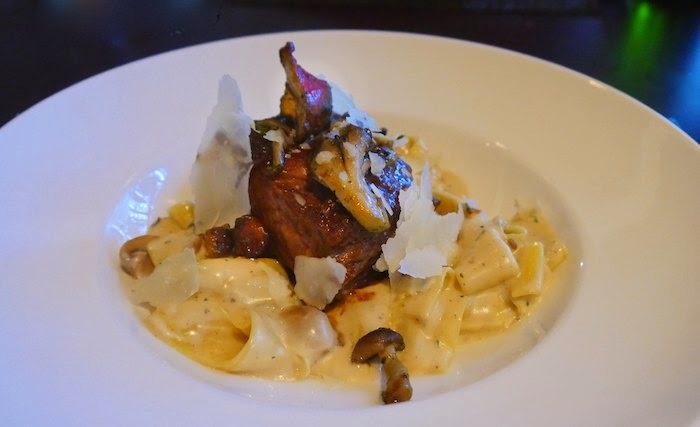 It was a delicious combination of short ribs with various organic mushrooms in a creamy garden herb sauce over pappardelle pasta. 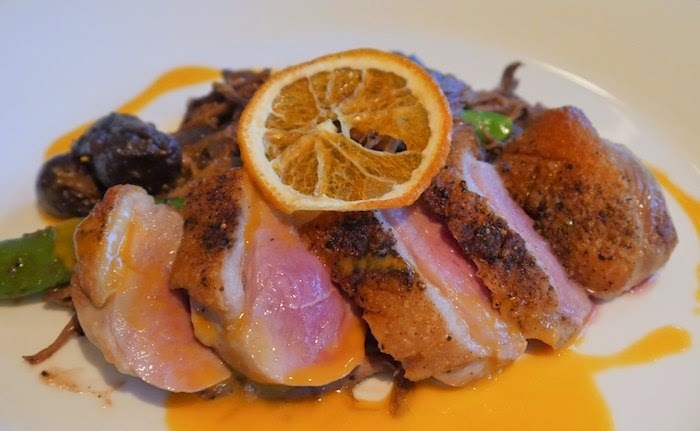 I ordered the Hudson Valley Duck breast, which was cooked to perfection and very tasty. It was served with a few cocoa gnocchi, pearl onions and spring peas. My only caveat was there was not enough green on the plate for my taste. 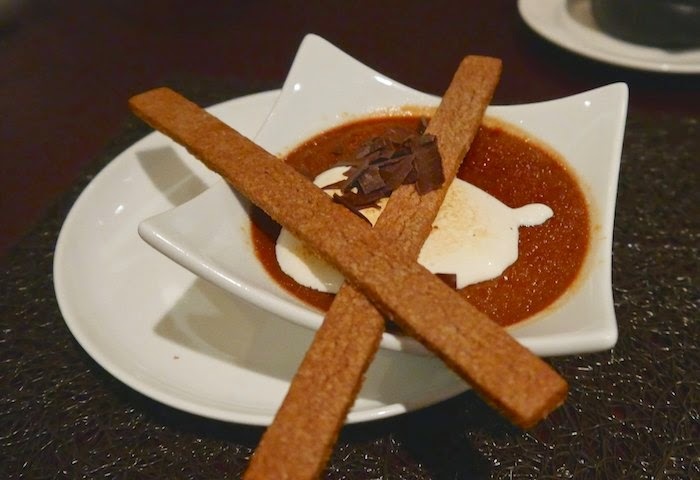 and the S’mores chocolate crème brulee with mesquite graham cracker strips were amazing. If neither of those options appeals to you, and I’m not sure how they couldn’t, you can always hold out for the mound of cotton candy that comes with your check. 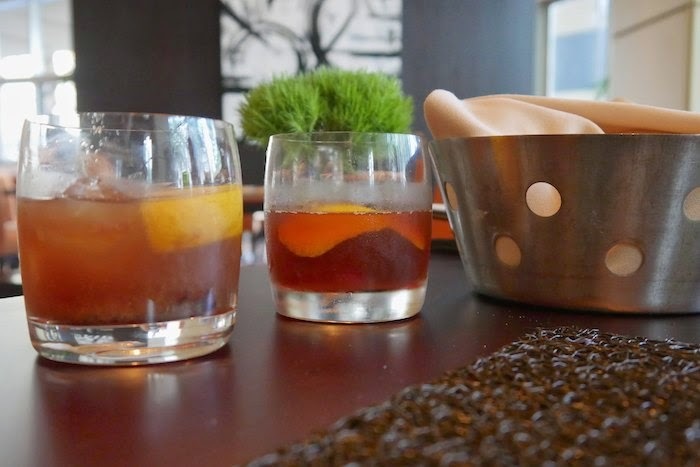 The next time you are in downtown Phoenix, be sure to stop in at District American Kitchen & Wine Bar; whether it’s for a delicious meal or to just grab a drink at the bar you will be happy you did. Atmosphere: comfortable yet metropolitan setting featuring local artwork and live music most nights. Additional Information: Happy Hour is Mon-Sat. from 3-7 p.m. and Reverse Happy Hour starts at 10 p.m. We have live music several nights a week and have half price bottles of wine all day on Sundays. We feature local products from around Arizona. Our wine and spirit list features only American made products and our beer list features only Arizona taps. Find a beer you like? Take it home with you in one of our 64 ounce growlers for just $20. Also, join our 3rd Street Beer Club and get your membership card punched every time you enjoy a pint. After 12 punches you can receive a free growler! Can also be seen on Arizona Weddings Magazine. Totally my kind of restaurant! 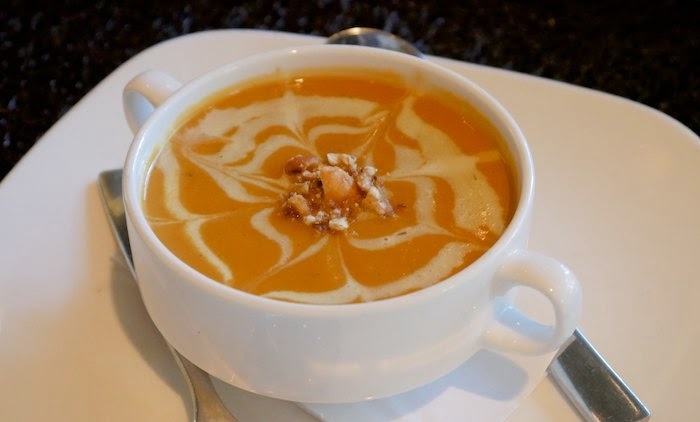 That Sweet Potato Soup looks beautiful! Wow, I want to go to AZ just to eat with you. lol. It all looks delicious but I'm super partial to that calamari! It looks so sleek and modern. I love that style. The desserts are to die for! Their manager is a master of the special touches -- when we walked out of our ceremony, there were two glasses of champagne. I could go on. I just love a plate of beautiful food! S’mores chocolate crème brulee?! That is just crazy. Like two of my favorite thing converged into one amazing entity :) Next time I find myself in Phoenix I might have to check this place out. What a beautiful place and all the food looks very delicious. I am tempted to visit Downtown Phoenix soon just for these restaurant.